On the Create tab in the Classifications group, click Case Classification. In the Attribute Values panel, click the plus sign to add attribute values. You can also add the values later in the classification sheet. 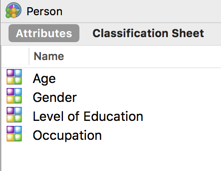 Auto code and classify a dataset containing survey responses, you can choose to create a new case classification with attributes from your closed-ended survey questions, such as Age or Gender. Auto code a dataset containing social media data (imported from NCapture files) and choose to code by Username, NVivo creates cases with the classification 'Facebook User' or 'Twitter User'. Information from the user's profile is stored as attribute values for each code.